NEW DELHI: The Supreme Court on Thursday has sternly asked the Karnataka government to provide 4 tmc of water to Tamil Nadu by May-end in the Cauvery river water dispute case. The Supreme Court also directed the Centre to file an affidavit in the matter. 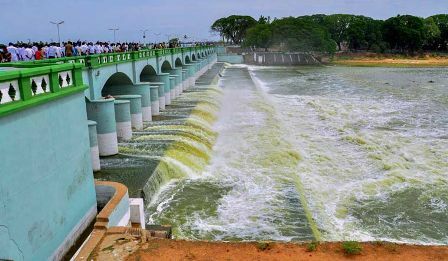 The case regarding the setting up of the Cauvery Management Board came up for hearing in the Supreme Court on Thursday. It may be recalled that the Centre had sought two weeks time, in the Supreme Court, for submission of the draft for the scheme. During Thursday's hearing, the Supreme Court also asked the Centre to apprise it on May 8—the day of next hearing—about steps taken for setting up of the Cauvery Management Board for implementation of its order. The Centre has sought time for setting up of the board on the ground that Prime Minister Narendra Modi and other ministers are busy campaigning in Karnataka. Attorney General K.K. Venugopal submitted to the Supreme Court that "the Cauvery Management Board draft has to be tabled before the Union cabinet and as Prime Minister is in Karnataka for elections, the draft, therefore, has not been approved yet". And hence, the AG has sought to hear the case next a day after the Karnataka polls.